Despite near universal agreement that reporting biases are harmful, efforts to correct the problem have largely focused on forward looking initiatives. Prospective registration of trials has made major strides in ensuring that the biomedical community is aware of trials at their inception, but at best only around half of registered trials on ClinicalTrials.gov were registered before they began enrolling patients.16 Recent studies have also shown that even when disclosure of study findings is mandated by law, results often remain invisible.17 18 19 In addition, trial registration does not address the problems of invisibility and distortion for trials that took place before registers were widely used. Most importantly, those demanding correcting action lacked the data required to actually correct the scientific record. However, with increasing amounts of data entering the public domain, it is now becoming possible to move from words to action and publish (or republish) abandoned trials. We have access to around 178 000 pages of previously confidential company research documents (table 1⇓, box). For drugs such as paroxetine, quetiapine, and gabapentin, litigation over illegal off-label marketing put thousands of pages of trial reports in the public domain. Other trial reports, such as for oseltamivir and clopidogrel, were obtained through new freedom of information policies at the European Medicines Agency (EMA) that have revolutionised the public’s ability to access trial data.20 21 22 23 The documents are a substantial resource of information about trials. We expect that other independent groups will also have access to many additional trial reports. The documents we have obtained include trial reports for studies that remain unpublished years after completion (such as Roche’s study M76001, the largest treatment trial of oseltamivir, and Pfizer’s study A945-1008, the largest trial of gabapentin for painful diabetic neuropathy). We also have thousands of pages of clinical study reports associated with trials that have been published in scientific journals but shown to contain inaccuracies, such as Roche’s oseltamivir study WV15671, GlaxoSmithKline’s paroxetine study 329, and Pfizer’s gabapentin study 945-291.3 12 24 25 We consider these to be examples of abandoned trials: either unpublished trials for which sponsors are no longer actively working to publish or published trials that are documented as misreported but for which authors do not correct the record using established means such as a correction or retraction (which is an abandonment of responsibility) (box 1).25 Because abandonment can lead to false conclusions about effectiveness and safety, we believe that it should be tackled through independent publication and republication of trials. Case report form—The original paper or electronic forms on which individual participants’ data (demographic, efficacy, safety, etc) are recorded during the clinical trial. The forms are typically the most “raw” form of detailed data available for understanding what happened in a clinical trial, and the data they contain are statistically analysed only after they have been entered into an electronic database of individual patient data. Forms can vary in length, from a few pages to hundreds of pages, and each trial can have multiple forms—for example, for different visits or for the different tests or procedures the participant undergoes. Investigators’ brochure—A document written by a sponsor and intended for clinical investigators interested in becoming involved in a study. It summarises the current body of evidence about an intervention under investigation, typically based on preclinical and human studies. The document is periodically updated in light of new information. We call on institutions that funded and investigators who conducted abandoned trials to publish (in the case of unpublished trials) or formally correct or republish (in the case of misreported trials) their studies within the next year. This should allow sufficient time for manuscript preparation, peer review, and publication. We will email a copy of this article to manufacturers of trials listed in table 1⇑, asking them to signal their intent to publish by sending an electronic response to the article within 30 days. We propose that if anyone who declares an intention to publish or correct does not do so within one year, all available data for such trials should be considered “public access data” that others are allowed to publish. We are committed to seeing the findings from abandoned trials published and describe here a minimum set of criteria for responsible publication and republication of abandoned studies (box 2). We call this concept restoring invisible and abandoned trials (RIAT). As the concept develops, interested individuals and organisations will ideally work together to develop detailed policies aimed at improving trial publication practices. We see RIAT as a collaborative, global effort, and over the next year we hope to discuss and debate our proposal at appropriate venues. For misreported trials—Evidence of misreporting (ideally, published letters or other articles in the scientific literature or documentation of communication with the original trial publication author(s) detailing the misreporting) and a failure to correct the scientific record. At least initially, this should be by an electronic response to this article and should include, as a minimum, trial identifiers, number of participants, date completed, publication status, pages in your holding, and level of access to trial data. This declaration offers original sponsors and trialists an opportunity to publish or formally correct their studies within the next 365 days. Send a copy of the rapid response by email to trial sponsors (and authors, for published trials), requesting confirmation of receipt. Save time stamped copies of all rapid responses to this article (or other relevant websites) to document the time elapsed and consequent need for third party restoration. Present editors with documentation from steps 1-4 and seek confirmation of editors’ interest. The major factor that makes publication of invisible and abandoned trials possible is the existence of clinical study reports (CSRs), documents produced by the pharmaceutical industry that include an unabridged and detailed summary of the planning, conduct, and results of a clinical trial.38 The reports are rigidly structured according to guidelines that industry and regulators agreed to in 1995 (box 3) and are almost always hundreds, if not thousands, of pages long. Manufacturers submit clinical study reports to the US Food and Drug Administration as part of applications for new drugs. In addition, the FDA typically also requires submission of the protocol and individual participant data. The European Medicines Agency does not routinely request individual participant data or clinical study reports.39 Although clinical study reports may be unfamiliar to the academic world, and in our experience are typically not produced for trials sponsored by non-commercial funders, when those in industry or the FDA want to know what occurred in an industry sponsored trial, they may refer to a clinical study report. When industry statisticians wish to carry out further analyses of the data, they can turn to their database of individual participant data. The rest of us, however—doctors, medical and public health researchers, patients, and non-regulatory government agencies including many health technology assessment groups—are left with only what is in the public domain (usually at best, synopses of the trials in the form of journal articles) (figure⇓).. Writing clinical study reports is now industry standard practice, but it was not always so. In the middle of the 20th century, the early years of randomised controlled trials, studies were small—initiated, carried out, and reported by a handful of investigators, often in an academic medical centre. Reporting was likewise more concise and simple—something that could be explained in a journal length article, with more detailed datasets available on request. Although by definition no journal publication exists for “unpublished trials,” clinical study reports for industry funded trials often do exist for these unpublished trials, but they have been traditionally treated as secret.48 49 However, litigation and new freedom of information rules in Europe have helped many clinical study reports to emerge in the public domain, thereby making the restorative authorship possible. In addition, some drug companies have recently pledged to release their reports.50 51 Not all of the clinical study reports and other materials we have obtained are complete. However, many contain sufficient detail to form a comprehensive understanding of the trials and would enable someone to produce a journal length manuscript for publication. We believe it is important to publish unpublished and other abandoned studies, even though they will at best represent a brief synopsis of all the publicly available data. This is because we live in a research and practice environment based on publications, and unpublished trials remain largely invisible. There is still no PubMed-like indexing system for unpublished clinical study reports. 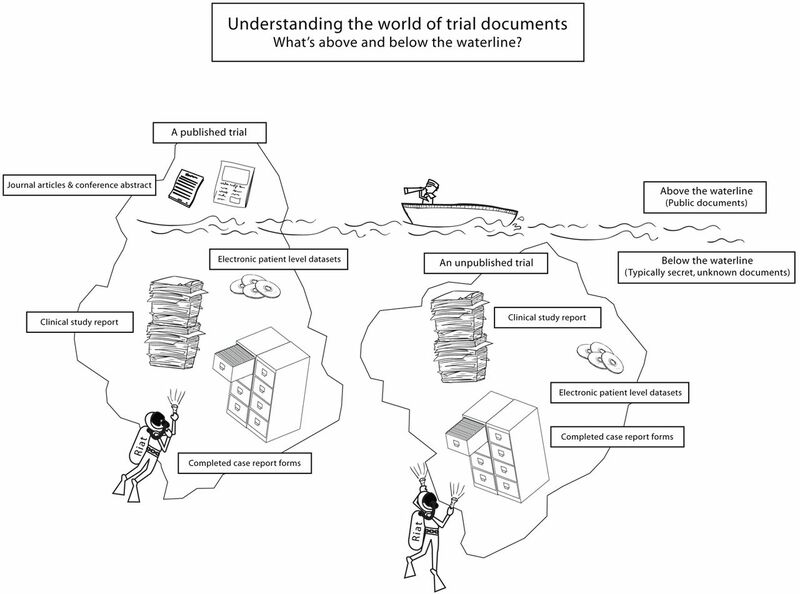 Moreover, most researchers will not have the time to sift through hundreds or thousands of pages to understand what occurred in a single clinical trial. We therefore need a shorthand representation, and the best we know of is journal publication. RIAT reports should also provide the context for the study to help the readers understand why the trial is being restored. This means including references to any previous publications of the trial and to details and evidence of the trial’s abandonment. RIAT analyses should follow the analyses specified in the protocol (including any specified in amendments). Any other analyses are discouraged, but if done must be clearly noted as exploratory and not prespecified. At the same time, RIAT authors may wish to critically appraise the trials they report. This can be useful, but the critique should be clearly identifiable and placed in the discussion section. Important details are still to be worked out (box 4 lists some of them), and we welcome discussion on how to get it right. Should the original trial investigators have the right to join a group of RIAT authors? Should RIAT authors contact original investigators for help in interpreting trial documents? Should old trials that are going to be subject to RIAT publication be registered in trial registries such as ClinicalTrials.gov (assuming this becomes possible)? Should registration preclude other restorative author teams from using the same data? Should RIAT publication related clinical study reports and audit records be stored on the publishing journal’s server or is a publicly available database required? Where should the declaration of intent to publish a RIAT trial be published? How should RIAT publications be cited? Should restoration be clearly identified in the publication title or the authorship byline? If yes, how? What (if any) additional rules or safeguards should RIAT authors apply to ensure patient confidentiality of individual patient data and clinical report forms that are already in the public domain? For misreported articles, what level of narrative detail regarding the misreporting should the RIAT publication contain? Should RIAT authors seek approval from an appropriate research ethics committee before publishing a trial with unclear prior ethical basis? The idea of restorative writing may be seen as taking on responsibility and credit for other people’s actions, regardless of the trial’s sponsor, but it takes on a slightly different cast when trials are funded by commercial sponsors rather than public money. Some people may think that publications based on clinical study reports with which the authors have no connection is equivalent to intellectual property theft, but you cannot steal what is already in the public domain (and only in the public domain because a drug regulator or judge had the documents unconditionally released or the sponsor waived their confidentiality claims over the documents). The considerable discussion about the need for public access to trial data and data ownership has not yet resolved how to handle the thorny but important question of proper scientific credit.59 60 61 RIAT authorship will not usurp proper credit for a trial. Rather, it will show how problematic the concepts of authorship and results reporting are in the modern clinical trial. RIAT authors would be able to claim credit for bringing to light what was previously invisible or distorted but not for carrying out the trial. In the case of the Roche sponsored oseltamivir trials, we have so far identified eight different layers of responsibility, perhaps partially overlapping: those who designed the trial, those who sponsored it, those who conducted it, those who analysed the data, those who wrote or assembled the clinical study report, those who decided the publication policy, those who decided which parts to publish (and in some cases not to publish), those who presented results at meetings or conferences, and, lastly, those who put their names to the published manuscript. None of these roles has a clear thread of accountability and authors of the published trials have confirmed that they did not have access to the underlying study data.45 62 In sum, in the context of the modern clinical trial research enterprise, the traditional journal article publication model obscures responsibility more than it illuminates. Is restorative writing fundamentally different from professional medical writing and “ghost writing”? One important difference is that hired medical writers are paid for their services by those who stand to gain from the publication and restorative authors are not. Restorative authors are also likely to have access to more detailed trial records than medical writers. Another difference is that medical writers are often instructed to insert “key messages” in publication ready manuscripts.11 63 Finally, medical writers are often unacknowledged in the publication and so are not accorded any responsibility for the work they produce. By contrast, RIAT authors will take full responsibility for publishing abandoned studies, although we will refer to RIAT to make it clear that the article is a work of restoration, not primary authorship. We are also contemplating how best to document RIAT authorship in our CVs: at a minimum, such publications need to be listed under a separate heading, identifying them as such. Recently, a group of drug manufacturers and medical journal editors published “ten recommendations for closing the credibility gap in reporting industry-sponsored clinical research,” aimed at eliminating reporting biases.64 Their recommendations do not go far enough to address the problems. They do not mention publishing abandoned trials and ignore responsibility for correcting reporting biases persisting in existing trial publications. Furrthermore, their recommendation to “make public all data” refers to publication of journal article length manuscripts rather than the full clinical study reports, individual participant data, investigators’ brochures, case report forms, and many other of the semi-secret documents that would help people to understand a trial and its place in the research or regulatory approval programme—meaning the published results would have to be taken on trust without the possibility of verification. Will the publication of detailed clinical study reports enable subsequent ill intentioned or otherwise misleading analyses by others (such as spurious findings from data dredging)? We challenge readers to provide an example of open clinical trial data sharing that has led to major public health harm. If RIAT evokes the spectre of data mining, it is important to remember that we currently have no way to judge the fidelity of the process of synthesising thousands of pages of a clinical study report into a journal publication. RIAT publication is important even for poorly conducted or unethical studies that many editors may not feel merit publication. Without public documentation that a trial was poorly done, researchers will be left guessing about the value of the study. A very brief trial report (without results if they would be misleading) may suffice. Finally, some people may argue that RIAT republication of a misreported study is muddying the published record for dubious gain, especially with older trials. We believe that correcting the scientific record is preferable to ignoring inaccuracies. If the accompanying data support what is reported in the RIAT republication, doubts about which publication is correct should not be a problem. The data we have obtained (table 1⇑) relate to only a small fraction of the masses of abandoned clinical trials. We call on others to join us, to contribute trial documents they have obtained from public sources that need publishing or republishing, and to help us with the writing. We need volunteers to act in place of those who should have but did not make trial reports visible and accessible. Endorsement of the concept of restorative authorship by medical journal editors will help the effort to complete and correct the scientific record. Journals can signal their willingness to accept RIAT publications by including details in their “instructions for authors.” We suggest that journals ask restorative authors to provide documentation of a trial’s status as abandoned, the provenance of data on which the RIAT publication is written (to ensure it is in the public domain), and to agree to submit the clinical study report and all other data used to write the manuscript as well as an audit record documenting what data were used. We suggest that to reduce wasted time on behalf of both authors and editors, authors submit a presubmission inquiry to discuss their case. Our declaration to publish will be the first step towards public and open debate on an issue that affects everyone and has for too long been the preserve of people acting behind closed doors. We thank Yuko Hara, Iain Chalmers, and Betsy Humphries for many helpful conversations and comments on the idea and draft manuscript. We also wish to thank the many others who made important contributions during the peer review process: external peer reviewers James Miller, Douglas McCrory, Margaret Winker, Emma Veitch, Andrew Vickers, Deborah Zarin, and Tony Tse and the BMJ editors, particularly Elizabeth Loder. Contributors and sources: PD conceived of RIAT and wrote the first draft of the manuscript with TJ. Numerous oral and written discussions among all authors shaped the RIAT concept. All authors contributed to the many rounds of editing. PD is guarantor. Competing interests: We have read and understood the BMJ Group policy on declaration of interests and declare the following: PD and TJ have published on influenza antivirals and received a UK National Institute of Health research grant for the update and amalgamation of two Cochrane reviews: neuraminidase inhibitors for preventing and treating influenza in healthy adults and children. PD received support from the European Respiratory Society for travel to the society’s September 2012 annual congress where he gave an invited talk. He is funded by an institutional training grant from the US Agency for Healthcare Research and Quality. AHRQ had no role in study design, data collection and analysis, decision to publish, or preparation of the manuscript. KD served as an expert witness in 2008 litigation against Pfizer relating to gabapentin. Funds from this effort were donated by the plaintiff’s lawyers to Johns Hopkins to support academic scholarship in the area of reporting biases. DH has been an expert witness in legal cases that have brought to light issues surrounding non-publication of trials and ghostwriting and an action by New York State that led some of the documents this article references to come to light. SSV was paid by the plaintiffs’ lawyers for assisting KD with preparing her expert witness report in 2008 litigation against Pfizer. SSV’s research related to reporting of trials in off-label uses of gabapentin was supported by an academic scholarship established at Johns Hopkins using funds from KD’s effort as an expert witness in the 2008 litigation against Pfizer. TJ receives royalties from his books published by Blackwell and Il Pensiero Scientifico Editore. He is occasionally interviewed by market research companies for anonymous interviews about Phase 1 or 2 products. He was a consultant in a legal case regarding oseltamivir. Song F, Parekh S, Hooper L, Loke YK, Ryder J, Sutton AJ, et al. Dissemination and publication of research findings: an updated review of related biases. Health Technol Assess2010;14(8):1-193. Rising K, Bacchetti P, Bero L. Reporting bias in drug trials submitted to the food and drug administration: review of publication and presentation. Plos Med2008;5:e217. Doshi P, Jones M, Jefferson T. Rethinking credible evidence synthesis. BMJ2012;344:d7898. Gøtzsche PC. Why we need easy access to all data from all clinical trials and how to accomplish it. Trials2011;12:249. Dickersin K, Min YI. Publication bias: the problem that won’t go away. Ann N Y Acad Sci1993;703:135-46; discussion 146-8. Melander H. Evidence b(i)ased medicine—selective reporting from studies sponsored by pharmaceutical industry: review of studies in new drug applications. BMJ2003;326:1171-3. McGauran N, Wieseler B, Kreis J, Schuler Y-B, Kolsch H, Kaiser T. Reporting bias in medical research - a narrative review. Trials2010;11:37. Sismondo S, Doucet M. Publication ethics and the ghost management of medical publication. Bioethics2009;24:273-83. Vedula SS, Bero L, Scherer RW, Dickersin K. Outcome reporting in industry-sponsored trials of gabapentin for off-label use. N Engl J Med2009;361:1963-71. Jefferson T, Jones MA, Doshi P, Del Mar CB, Heneghan CJ, Hama R, et al. Neuraminidase inhibitors for preventing and treating influenza in healthy adults and children. Cochrane Database Syst Rev2012;1:CD008965. Vedula SS, Li T, Dickersin K. Differences in reporting of analyses in internal company documents versus published trial reports: comparisons in industry-sponsored trials in off-label uses of gabapentin. PLoS Med2013;10:e1001378. Chan A-W. Bias, spin, and misreporting: time for full access to trial protocols and results. Plos Med2008;5:e230. Califf RM, Zarin DA, Kramer JM, Sherman RE, Aberle LH, Tasneem A. Characteristics of clinical trials registered in ClinicalTrials.gov, 2007-2010. JAMA2012;307:1838-47. Prayle AP, Hurley MN, Smyth AR. Compliance with mandatory reporting of clinical trial results on ClinicalTrials.gov: cross sectional study. BMJ2012;344:d7373. Law MR, Kawasumi Y, Morgan SG. Despite law, fewer than one in eight completed studies of drugs and biologics are reported on time on ClinicalTrials.gov. Health Affairs2011;30:2338 -45. Zarin DA, Tse T, Williams RJ, Califf RM, Ide NC. The ClinicalTrials.gov results database — update and key issues. N Engl J Med2011;364:852-60. European Medicines Agency. European Medicines Agency policy on access to documents (related to medicinal products for human and veterinary use. 2010. www.ema.europa.eu/docs/en_GB/document_library/Other/2010/11/WC500099473.pdf. European Medicines Agency. Output of the European Medicines Agency policy on access to documents related to medicinal products for human and veterinary use. 2010 www.ema.europa.eu/docs/en_GB/document_library/Regulatory_and_procedural_guideline/2010/11/WC500099472.pdf. HMA/EMA Working Group on Transparency. HMA/EMA guidance document on the identification of commercially confidential information and personal data within the structure of the marketing authorisation (MA) application - release of information after the granting of a marketing authorisation. 2012 www.ema.europa.eu/docs/en_GB/document_library/Other/2012/03/WC500124536.pdf. Doshi P, Jefferson T. The first 2 years of the European Medicines Agency’s policy on access to documents: secret no longer. JAMA Intern Med2013;173:380-2. Jureidini JN, McHenry LB, Mansfield PR. Clinical trials and drug promotion: Selective reporting of study 329. Int J Risk Safety Med2008;20:73-81. Newman M. The rules of retraction. BMJ2010;341:c6985. Boulton G, Rawlins M, Vallance P, Walport M. Science as a public enterprise: the case for open data. Lancet2011;377:1633-5. Fromer M. Public access to research data: a right to know or off limits? Oncology Times2001;23:52-4. Chan A-W, Tetzlaff JM, Altman DG, Laupacis A, Gøtzsche PC, Krleža-Jerić K, et al. SPIRIT 2013 statement: defining standard protocol items for clinical trials. Ann Intern Med2013;158:200-7. Chan A-W, Tetzlaff JM, Gøtzsche PC, Altman DG, Mann H, Berlin JA, et al. SPIRIT 2013 explanation and elaboration: guidance for protocols of clinical trials. BMJ2013;346:e7586. Department of Energy. Comprehensive epidemiologic data resource. 2012 www.orau.gov/cedr/. National Heart Lung and Blood Institute. Women’s Health Initiative. 2011. www.nhlbi.nih.gov/whi/references.htm. Food and Drug Administration. Food and Drug Administration Amendments Act of 2007. Slade J, Bero LA, Hanauer P, Barnes DE, Glantz SA. Nicotine and Addiction. The Brown and Williamson documents. JAMA1995;274:225-33. Hersch J, Libert O, Rogg-Effront C. Final report on project hippo I. 1962. http://legacy.library.ucsf.edu/tid/buc72d00/pdf. Pendleton C, Olivi A, Brem H, Quiñones-Hinojosa A. Harvey Cushing’s early treatment of meningiomas: the untold story. World Neurosurgery2011 Nov http://linkinghub.elsevier.com/retrieve/pii/S1878875011010011. Coyne DW. The health-related quality of life was not improved by targeting higher hemoglobin in the Normal Hematocrit Trial. Kidney Int2012;82:235-41. Besarab A, Bolton WK, Browne JK, Egrie JC, Nissenson AR, Okamoto DM, et al. The effects of normal as compared with low hematocrit values in patients with cardiac disease who are receiving hemodialysis and epoetin. N Engl J Med1998;339:584-90. Doshi P, Jefferson T. Clinical study reports of randomised controlled trials: an exploratory review of previously confidential industry reports. BMJ Open2013;3:e002496. European Medicines Agency. Note for guidance on the inclusion of appendices to clinical study reports in marketing authorisation applications. 2004. www.ema.europa.eu/docs/en_GB/document_library/Scientific_guideline/2009/09/WC500003638.pdf. Glickman SW, McHutchison JG, Peterson ED, Cairns CB, Harrington RA, Califf RM, et al. Ethical and scientific implications of the globalization of clinical research. N Engl J Med2009;360:816-23. Mirowski P, Van Horn R. The contract research organization and the commercialization of scientific research. Soc Stud Sci2005;35:503-48. Mello MM, Clarridge BR, Studdert DM. Academic medical centers’ standards for clinical-trial agreements with industry. N Engl J Med2005;352:2202-10. Healy D. Pharmageddon. 1st ed. University of California Press, 2012. Blumsohn A. Authorship, ghost-science, access to data and control of the pharmaceutical scientific literature: who stands behind the word? AAAS Professional Ethics Report2006;19:1-4. Korn D, Ehringhaus S. Principles for strengthening the integrity of clinical research. PLoS Clin Trials2006. www.ncbi.nlm.nih.gov/pmc/articles/PMC1488888/. International Conference on Harmonisation of Technical Requirements for Registration of Pharmaceuticals for Human Use. Structure and content of clinical study reports: E3. 1995 www.ich.org/fileadmin/Public_Web_Site/ICH_Products/Guidelines/Efficacy/E3/E3_Guideline.pdf. Hendrick R. Ghosts in the machine. BMJ2011;343:d7860. Doshi P, Jefferson T, Del Mar C. The imperative to share clinical study reports: recommendations from the Tamiflu experience. PLoS Med2012;9:e1001201. Unlu M. It is time: why the FDA should start disclosing drug trial data. Mich Telecomm Tech L Rev2010;16:511-45. Hoffmann-La Roche. Roche launches new process for accessing clinical trial data Press release, 26 Feb 2013. www.roche.com/media/media_releases/med-cor-2013-02-26.htm. GlaxoSmithKline. GSK announces further initiatives to advance openness and collaboration to help tackle global health challenges. Press release, 11 Oct 2012 . www.gsk.com/media/press-releases/2012/GSK-announces-further-initiatives-to-tackle-global-health-challenges.html. Schulz KF, Altman DG, Moher D, CONSORT Group. CONSORT 2010 statement: updated guidelines for reporting parallel group randomised trials. BMJ2010;340:c332. Hrynaszkiewicz I, Norton ML, Vickers AJ, Altman DG. Preparing raw clinical data for publication: guidance for journal editors, authors, and peer reviewers. BMJ2010;340:c181. Laine C, Goodman SN, Griswold ME, Sox HC. Reproducible research: moving toward research the public can really trust. Ann Intern Med2007;146:450-3. Groves T. BMJ policy on data sharing. BMJ2010 Jan 28;340:c564. Hanson B, Sugden A, Alberts B. Making data maximally available. Science2011;331:649. Bauchner H, Fontanarosa PB. Restoring confidence in the pharmaceutical industry. JAMA2013;309:607-9. Eichler H-G, Abadie E, Breckenridge A, Leufkens H, Rasi G. Open clinical trial data for all? a view from regulators. PLoS Med2012;9:e1001202. Rennie D, Yank V, Emanuel L. When authorship fails. A proposal to make contributors accountable. JAMA1997;278:579-85. Smith R. Authorship is dying: long live contributorship. BMJ1997;315:696. Horton R. The signature of responsibility. Lancet1997;350:5-6. Cohen D. Complications: tracking down the data on oseltamivir. BMJ2009;339:b5387. Fugh-Berman AJ. The haunting of medical journals: how ghostwriting sold “HRT”. PLoS Med2010;7:e1000335. Mansi BA, Clark J, David FS, Gesell TM, Glasser S, Gonzalez J, et al. Ten recommendations for closing the credibility gap in reporting industry-sponsored clinical research: a joint journal and pharmaceutical industry perspective. Mayo Clin Proc2012;87:424-9. University of California. Legacy tobacco documents library. 2007. http://legacy.library.ucsf.edu/. Calabrese JR, Keck PE Jr, Macfadden W, Minkwitz M, Ketter TA, Weisler RH, et al. A randomized, double-blind, placebo-controlled trial of quetiapine in the treatment of bipolar I or II depression. Am J Psychiatry2005;162:1351-60. Newcomer JW, Ratner RE, Eriksson JW, Emsley R, Meulien D, Miller F, et al. A 24-week, multicenter, open-label, randomized study to compare changes in glucose metabolism in patients with schizophrenia receiving treatment with olanzapine, quetiapine, or risperidone. J Clin Psychiatry2009;70:487-99. CAPRIE Steering Committee. A randomised, blinded, trial of clopidogrel versus aspirin in patients at risk of ischaemic events (CAPRIE). Lancet1996;348:1329-39. Yusuf S, Zhao F, Mehta SR, Chrolavicius S, Tognoni G, Fox KK. Effects of clopidogrel in addition to aspirin in patients with acute coronary syndromes without ST-segment elevation. N Engl J Med2001;345:494-502. Sabatine MS, McCabe CH, Gibson CM, Cannon CP. Design and rationale of clopidogrel as adjunctive reperfusion therapy-thrombolysis in myocardial infarction (CLARITY-TIMI) 28 trial. Am Heart J2005;149:227-33. Sabatine MS, Cannon CP, Gibson CM, López-Sendón JL, Montalescot G, Theroux P, et al. Addition of clopidogrel to aspirin and fibrinolytic therapy for myocardial infarction with ST-segment elevation. N Engl J Med2005;352:1179-89. Chen ZM, Jiang LX, Chen YP, Xie JX, Pan HC, Peto R, et al. Addition of clopidogrel to aspirin in 45,852 patients with acute myocardial infarction: randomised placebo-controlled trial. Lancet2005;366:1607-21. Li JS, Yow E, Berezny KY, Bokesch PM, Takahashi M, Graham TP Jr, et al. Dosing of clopidogrel for platelet inhibition in infants and young children: primary results of the Platelet Inhibition in Children On cLOpidogrel (PICOLO) trial. Circulation2008;117:553-9. Keck PE, Orsulak PJ, Cutler AJ, Sanchez R, Torbeyns A, Marcus RN, et al. Aripiprazole monotherapy in the treatment of acute bipolar I mania: a randomized, double-blind, placebo- and lithium-controlled study. J Affect Disord2009;112:36-49. Rümke HC, Bayas J-M, De Juanes J-R, Caso C, Richardus JH, Campins M, et al. Safety and reactogenicity profile of an adjuvanted H5N1 pandemic candidate vaccine in adults within a phase III safety trial. Vaccine2008;26:2378-88. Keller MB, Ryan ND, Strober M, Klein RG, Kutcher SP, Birmaher B, et al. Efficacy of paroxetine in the treatment of adolescent major depression: a randomized, controlled trial. J Am Acad Child Adolesc Psychiatry2001;40:762-72. Berard R, Fong R, Carpenter DJ, Thomason C, Wilkinson C. An international, multicenter, placebo-controlled trial of paroxetine in adolescents with major depressive disorder. J Child Adolesc Psychopharmacol2006;16:59-75. Geller DA, Biederman J, Stewart SE, Mullin B, Farrell C, Wagner KD, et al. Impact of comorbidity on treatment response to paroxetine in pediatric obsessive-compulsive disorder: is the use of exclusion criteria empirically supported in randomized clinical trials? J Child Adolesc Psychopharmacol2003;13(suppl 1):S19-29. Braconnier A, Le Coent R, Cohen D. Paroxetine versus clomipramine in adolescents with severe major depression: a double-blind, randomized, multicenter trial. J Am Acad Child Adolesc Psychiatry2003;42:22-9. Emslie GJ, Wagner KD, Kutcher S, Krulewicz S, Fong R, Carpenter DJ, et al. Paroxetine treatment in children and adolescents with major depressive disorder: a randomized, multicenter, double-blind, placebo-controlled trial. J Am Acad Child Adolesc Psychiatry2006;45:709-19. Geller DA, Wagner KD, Emslie G, Murphy T, Carpenter DJ, Wetherhold E, et al. Paroxetine treatment in children and adolescents with obsessive-compulsive disorder: a randomized, multicenter, double-blind, placebo-controlled trial. J Am Acad Child Adolesc Psychiatry2004;43:1387-96. Findling RL, Nucci G, Piergies AA, Gomeni R, Bartolic EI, Fong R, et al. Multiple dose pharmacokinetics of paroxetine in children and adolescents with major depressive disorder or obsessive-compulsive disorder. Neuropsychopharmacol2006;31:1274-85. Wagner KD, Berard R, Stein MB, Wetherhold E, Carpenter DJ, Perera P, et al. A multicenter, randomized, double-blind, placebo-controlled trial of paroxetine in children and adolescents with social anxiety disorder. Arch Gen Psychiatry2004;61:1153-62. Fong R, Carpenter D, Lipschitz A, Krulewicz S, Machin A, Wilkinson C. Long-term safety and tolerability of paroxetine. J Child Adolesc Psychopharmacol2005;15:856. Matsumoto K, Ogawa N, Nerome K, Numazaki Y, Kawakami Y, Shirato K, et al. Safety and efficacy of the neuraminidase inhibitor zanamivir in treating influenza virus infection in adults: results from Japan. GG167 Group. Antivir Ther1999;4:61-8. Murphy KR, Eivindson A, Pauksens K, Stein WJ, Tellier G, Watts R, et al. Efficacy and safety of inhaled zanamivir for the treatment of influenza in patients with asthma or chronic obstructive pulmonary disease: a double-blind, randomised, placebo-controlled, multicentre study. Clin Drug Investig2000;20:337-49. Hedrick JA, Barzilai A, Behre U, Henderson FW, Hammond J, Reilly L, et al. Zanamivir for treatment of symptomatic influenza A and B infection in children five to twelve years of age: a randomized controlled trial. Pediatr Infect Dis J2000;19:410-7. Hayden FG, Gubareva LV, Monto AS, Klein TC, Elliot MJ, Hammond JM, et al. Inhaled zanamivir for the prevention of influenza in families. Zanamivir Family Study Group. N Engl J Med2000;343:1282-9. Puhakka T, Lehti H, Vainionpää R, Jormanainen V, Pulkkinen M, Sharp S, et al. Zanamivir: a significant reduction in viral load during treatment in military conscripts with influenza. Scand J Infect Dis2003;35:52-8. Monto AS, Pichichero ME, Blanckenberg SJ, Ruuskanen O, Cooper C, Fleming DM, et al. Zanamivir prophylaxis: an effective strategy for the prevention of influenza types A and B within households. J Infect Dis2002;186:1582-8. LaForce C, Man CY, Henderson FW, McElhaney JE, Hampel FC Jr, Bettis R, et al. Efficacy and safety of inhaled zanamivir in the prevention of influenza in community-dwelling, high-risk adult and adolescent subjects: a 28-day, multicenter, randomized, double-blind, placebo-controlled trial. Clin Ther2007;29:1579-90; discussion 1577-8. Hayden FG, Osterhaus ADME, Treanor JJ, Fleming DM, Aoki FY, Nicholson KG, et al. Efficacy and safety of the neuraminidase inhibitor zanamivir in the treatment of influenzavirus infections. N Engl J Med1997;337:874-80. Peng AW, Hussey EK, Moore KH. A population pharmacokinetic analysis of zanamivir in subjects with experimental and naturally occurring influenza: effects of formulation and route of administration. J Clin Pharmacol2000;40:242-9. Schilling M, Povinelli L, Krause P, Gravenstein M, Ambrozaitis A, Jones HH, et al. Efficacy of zanamivir for chemoprophylaxis of nursing home influenza outbreaks. Vaccine1998;16:1771-4. Monto AS, Webster A, Keene O. Randomized, placebo-controlled studies of inhaled zanamivir in the treatment of influenza A and B: pooled efficacy analysis. J Antimicrob Chemother1999;44(suppl 2):23–9. Gravenstein S, Drinka P, Osterweil D, Schilling M, Krause P, Elliott M, et al. Inhaled zanamivir versus rimantadine for the control of influenza in a highly vaccinated long-term care population. J Am Med Dir Assoc2005;6:359-66. Ambrozaitis A, Gravenstein S, van Essen GA, Rubinstein E, Balciuniene L, Stikleryte A, et al. Inhaled zanamivir versus placebo for the prevention of influenza outbreaks in an unvaccinated long-term care population. J Am Med Dir Assoc2005;6:367-74. Monto AS, Robinson DP, Herlocher ML, Hinson JM, Elliott MJ, Crisp A. Zanamivir in the prevention of influenza among healthy adults: a randomized controlled trial. JAMA1999;282:31-5. Monto AS, Fleming DM, Henry D, de Groot R, Makela M, Klein T, et al. Efficacy and safety of the neuraminidase inhibitor zanamivirin the treatment of influenza A and B virus infections. J Infect Dis1999;180:254-61. Kaiser L, Henry D, Flack NP, Keene O, Hayden FG. Short-term treatment with zanamivir to prevent influenza: results of a placebo-controlled study. Clin Infect Dis2000;30:587-9. Randomised trial of efficacy and safety of inhaled zanamivir in treatment of influenza A and B virus infections. Lancet1998;352:1877-81. Mäkelä MJ, Pauksens K, Rostila T, Fleming DM, Man CY, Keene ON, et al. Clinical efficacy and safety of the orally inhaled neuraminidase inhibitor zanamivir in the treatment of influenza: a randomized, double-blind, placebo-controlled European study. J Infect2000;40:42-8. Banzhoff A, Gasparini R, Laghi-Pasini F, Staniscia T, Durando P, Montomoli E, et al. MF59-adjuvanted H5N1 vaccine induces immunologic memory and heterotypic antibody responses in non-elderly and elderly adults. PLoS One2009;4:e4384. Vesikari T, Karvonen A, Tilman S, Borkowski A, Montomoli E, Banzhoff A, et al. Immunogenicity and safety of MF59-adjuvanted H5N1 influenza vaccine from infancy to adolescence. Pediatrics2010;126:e762-70. Backonja M, Beydoun A, Edwards KR, Schwartz SL, Fonseca V, Hes M, et al. Gabapentin for the symptomatic treatment of painful neuropathy in patients with diabetes mellitus: a randomized controlled trial. JAMA1998;280:1831-6. Pande AC, Crockatt JG, Janney CA, Werth JL, Tsaroucha G. Gabapentin in bipolar disorder: a placebo-controlled trial of adjunctive therapy. Bipolar Disord2000;2:249-55. Mathew NT, Rapoport A, Saper J, Magnus L, Klapper J, Ramadan N, et al. Efficacy of gabapentin in migraine prophylaxis. Headache2001;41:119-28. Serpell MG. Gabapentin in neuropathic pain syndromes: a randomised, double-blind, placebo-controlled trial. Pain2002;99:557-66. Gordh TE, Stubhaug A, Jensen TS, Arnèr S, Biber B, Boivie J, et al. Gabapentin in traumatic nerve injury pain: a randomized, double-blind, placebo-controlled, cross-over, multi-center study. Pain2008;138:255-66. Gómez-Pérez FJ, Perez-Monteverde A, Nascimento O, Aschner P, Tagle M, Fichtner K, et al. Gabapentin for the treatment of painful diabetic neuropathy: dosing to achieve optimal clinical response. Br J Diabetes Vasc Dis2004;4:173-8. Caraceni A, Zecca E, Bonezzi C, Arcuri E, Yaya Tur R, Maltoni M, et al. Gabapentin for neuropathic cancer pain: a randomized controlled trial from the Gabapentin Cancer Pain Study Group. J Clin Oncol2004;22:2909-17. Vieta E, Manuel Goikolea J, Martínez-Arán A, Comes M, Verger K, Masramon X, et al. A double-blind, randomized, placebo-controlled, prophylaxis study of adjunctive gabapentin for bipolar disorder. J Clin Psychiatry2006;67:473-7. Versiani M, Amin M, Chouinard G. Double-blind, placebo-controlled study with reboxetine in inpatients with severe major depressive disorder. J Clin Psychopharmacol2000;20:28-34. Massana J, Möller HJ, Burrows GD, Montenegro RM. Reboxetine: a double-blind comparison with fluoxetine in major depressive disorder. Int Clin Psychopharmacol1999;14:73-80. Ferguson JM, Wesnes KA, Schwartz GE. Reboxetine versus paroxetine versus placebo: effects on cognitive functioning in depressed patients. Int Clin Psychopharmacol2003;18:9-14. Baldwin D, Bridgman K, Buis C. Resolution of sexual dysfunction during double-blind treatment of major depression with reboxetine or paroxetine. J Psychopharmacol2006;20:91-6. Langworth S, Bodlund O, Agren H. Efficacy and tolerability of reboxetine compared with citalopram: a double-blind study in patients with major depressive disorder. J Clin Psychopharmacol2006;26:121-7. Hayden FG, Atmar RL, Schilling M, Johnson C, Poretz D, Paar D, et al. Use of the selective oral neuraminidase inhibitor oseltamivir to prevent influenza. N Engl J Med1999;341:1336-43. Nicholson KG, Aoki FY, Osterhaus AD, Trottier S, Carewicz O, Mercier CH, et al. Efficacy and safety of oseltamivir in treatment of acute influenza: a randomised controlled trial. Lancet2000;355:1845-50. Treanor JJ, Hayden FG, Vrooman PS, Barbarash R, Bettis R, Riff D, et al. Efficacy and safety of the oral neuraminidase inhibitor oseltamivir in treating acute influenza: a randomized controlled trial. JAMA2000;283:1016-24. Hayden FG, Jennings L, Robson R, Schiff G, Jackson H, Rana B, et al. Oral oseltamivir in human experimental influenza B infection. Antivir Ther (Lond)2000;5:205-13. Welliver R, Monto AS, Carewicz O, Schatteman E, Hassman M, Hedrick J, et al. Effectiveness of oseltamivir in preventing influenza in household contacts: a randomized controlled trial. JAMA2001;285:748-54. Peters PH Jr, Gravenstein S, Norwood P, De Bock V, Van Couter A, Gibbens M, et al. Long-term use of oseltamivir for the prophylaxis of influenza in a vaccinated frail older population. J Am Geriatr Soc2001;49:1025-31. Whitley RJ, Hayden FG, Reisinger KS, Young N, Dutkowski R, Ipe D, et al. Oral oseltamivir treatment of influenza in children. Pediatr Infect Dis J2001;20:127-33. Johnston SL, Ferrero F, Garcia ML, Dutkowski R. Oral oseltamivir improves pulmonary function and reduces exacerbation frequency for influenza-infected children with asthma. Pediatr Infect Dis J2005;24:225-32. Dutkowski R, Smith JR, Davies BE. Safety and pharmacokinetics of oseltamivir at standard and high dosages. Int J Antimicrob Agents2010;35:461-7. Hayden FG, Belshe R, Villanueva C, Lanno R, Hughes C, Small I, et al. Management of influenza in households: a prospective, randomized comparison of oseltamivir treatment with or without postexposure prophylaxis. J Infect Dis2004;189:440-9. Aronoff S, Rosenblatt S, Braithwaite S, Egan JW, Mathisen AL, Schneider RL. Pioglitazone hydrochloride monotherapy improves glycemic control in the treatment of patients with type 2 diabetes: a 6-month randomized placebo-controlled dose-response study. Diabetes Care2000;23:1605-11.